When it comes to dental fillings, would you rather have the traditional metal ones that are highly noticeable or those that are almost similar to your teeth? Composite tooth fillings, also popularly known as tooth colored fillings are made of material that closely matches the shade of your teeth. Your dentist may either use these fillings if you have cavities, chipped teeth, or as a replacement for already existing metal fillings. If you are looking for a more natural way to preserve your tooth structure, tooth colored fillings is the way to go. Why? The composite material that makes up the filling chemically glues itself to your tooth surface like adhesive. Composite fillings are designed to restore your dental health, without necessarily getting noticed, as they also appear to be exceptionally natural. The treatment and recovery process may take longer than other traditional fillings, but for a discreet and less invasive tooth restoration technique, it is totally worth it. Since they are highly inconspicuous, tooth colored fillings are preferred for those teeth closest to the front of your mouth, allowing you to smile without having to worry. The good news is, with the advancement in dental technology, we can now use these composite fillings on molars, since they are more susceptible to wear as compared to other teeth. Why go for composite fillings? There are numerous benefits associated with using composite fillings, as opposed to the regular metal fillings. To begin with, your new fillings will not turn black over time and you never have to worry about any chips, leaks or infections. Silicon dioxide is used in preparation of composite fillings and its known to not only strengthen, but also to stabilize teeth, leaving them in a much better shape. The procedure only takes minutes, and your oral hygiene is improved greatly. Are you an ideal candidate for composite fillings? If you have a chipped or broken tooth, cavity, a deteriorated filling or are unhappy with your old filling, you are definitely a perfect candidate. However, you should first talk to your dentist who should be able to guide you further. You should not be worried about any pain during the treatment process. This is because your dentist will first use a local anesthetic to numb the area. 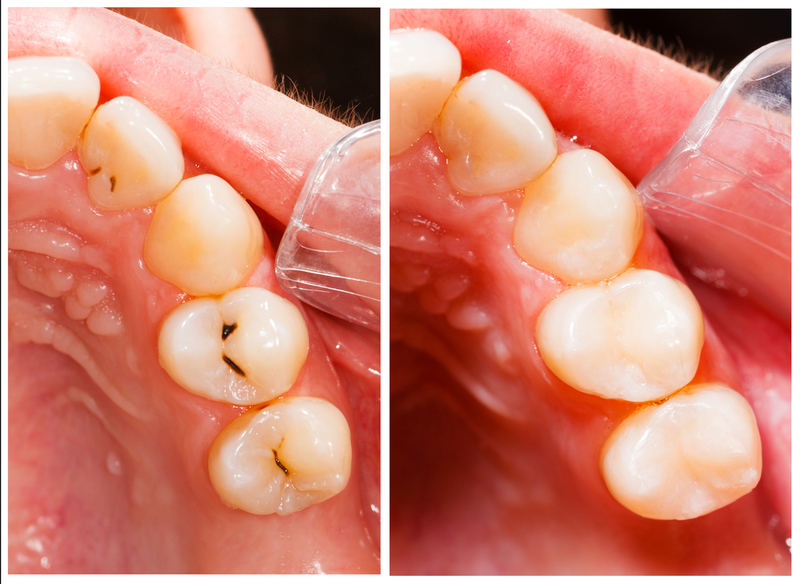 The next process involves removing the decayed area, to create room for the composite filling. We place a resin over this area and use a handheld light to cure it, before shaping and finally polishing the new filling. How about the post treatment care? As we have mentioned above, we use a light to cure the resin, which is what eventually forms a filling. Therefore, the recovery period is minimal and you should be okay right after your procedure. You may experience some sensitivity to hot and cold the following couple of days after your procedure. If this persists, kindly check back with your dentist for further assessment. Moreover, we highly recommend getting back to rigorous your oral care immediately after the procedure, to keep the area clean. For more information or consultation, please contact Dr. Tyson, a Huntsville dentist who will be more than happy to help.